The RBG cultivates native Jordanian plants in the nursery at the Garden site in Tal Al-Rumman. We grow from seed, cuttings and rhisomes both in greenhouses and in the open air. The initial aim of our Plant Nursery is to raise a large supply of native species for planting in the five Jordanian habitats that we are re-creating ex situ at our site in Tal Al-Rumman: the Deciduous Oak Forest Habitat, Pine Forest Habibat, Juniper Forest Habitat, Freshwater Habitat and Jordan Valley Habitat. For the moment, our plant production is geared mostly to planting in the Garden. But as we expand, we will also make a wide range of Jordan's native plants available for sale to the general public. The RBG is playing an instrumental role in propagating threatened species. 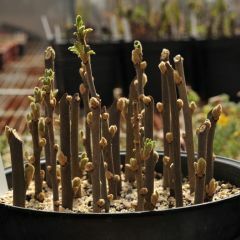 For instance, we are currently growing Moringa peregrina, a rare and threatened species in Jordan. We hope our work at the Royal Botanic Garden will have an influence the plant choices of urban landscapers, rural land reclaimers and private citizens alike. We dearly wish to see a resurgence in the use of native Jordanian trees, shrubs and flowers throughout the country. The native plants of Jordan are by far the best suited to the arid climate of Jordan. They can flourish with less water... and they are beautiful! See more Plant Nursery pictures in the photo gallery below. The RBG grows all sorts of native species in the Plant Nursery.